This is by Gerald Sparrow, an author I collect, since I first discovered him in The Star Sapphires, a barely believable tale (the best kind) of fabulous gems and shady characters in Bangkok right after the war, where Sparrow had been interned by the Japanese, having been a British judge (though Siam was never colonised, there was a separate legal system for expatriates). He gets out of prison, finds an apartment, a girl, and a new job as a lawyer and night-club owner in almost no time at all. The Star Sapphires belonged to one of his more unlikely clients. (I rather fancy reading this book again sometime). Sparrow rewrote his experiences in several different books, and I don't blame him, as he had a very interesting life. Looking on my shelf I see: The Golden Orchid about his night-club and a chanteuse called Nicole, who became the paramour of general Tanaka during the war; "Land of the Moonflower", more generally about Thailand, with some pictures of Sparrow and his girlfriend, also contains story of a gangster shootout; No other elephant , about Pra Chorn, and his English master who fell in love with a Chieng Mai princess; "Not Wisely But Too Well", which I have not read yet, along with various titles like The Great Defenders , "The Great Deceivers", and "The Great Persecutors", obviously written to put bread on the table. He also wrote Opium Venture , the only title to make it to paperback (not yet read). "Confessions of an Eccentric" starts when Sparrow turns 50, and decides to return to England. 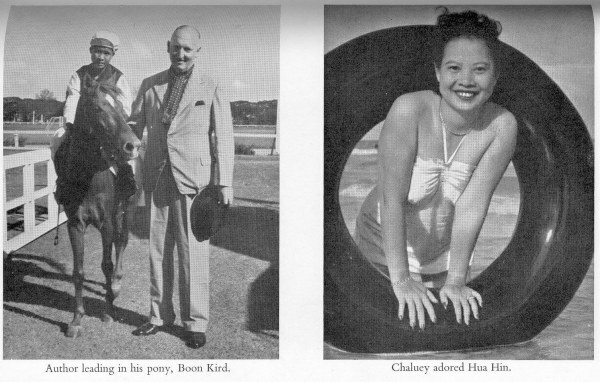 He marries his Thai girl Chaluey, I was glad to find out. (Chaluey thinks she has gone blind during a London Fog). He tells how he wrote his first books. He voices his familiar opinions about Eastern girls, and their superior way of treating a man! Then he describes running for Parliament, and several trips he made to the Near East, to write books about Jordan and Egypt. He gets a bit journalistic here (i.e. boring), and these are not countries that interest me specially. But it shows his versatility. The book he is proudest of is "Gordon: Mandarin and Pasha", apparently a very interesting incident of British imperial history about which I am completely ignorant. So that goes on the list. But I would not recommend "Confessions" unless you get hooked on some of the other tales first. Tom wrote: Lytton Strachey's 100-page monograph "The End of General Gordon" is the definitive treatment; it is contained in his book Eminent Victorians (widely available). In his essay on Strachey, Max Beerbohm praised it as his best work. I read it about two years ago, and enjoyed it very much. Strachey is unfortunately humorless (in stark contrast to Max), but his prose is artful and the story dramatic.